In holding ourselves with compassion, we become free to love this living world. Radical Acceptance is the first book by Tara Brach, a Buddhist mindfulness meditation teacher, therapist, yogi, and mother. Tara has lived through her share of hells and heavens, growing to appreciate, care for and genuinely love herself. “Believing that something is wrong with us is a deep and tenacious suffering,” she writes. This suffering emerges in crippling self-judgments and conflicts in our relationships, in addictions and perfectionism, in loneliness and overwork—all the forces that keep our lives constricted and unfulfilled. With warmth and clarity, Tara draws on twenty years of work with therapy clients and Buddhist students to illuminate the path to freedom from “the trance of unworthiness.” She offers telling personal stories, fresh interpretations of Buddhist tales, and twelve guided meditations, step-by-step leading us to trust our innate goodness. We don’t have to wait until we are on our deathbed to realize what a waste of our precious lives it is to carry the belief that something is wrong with us. Yet because our habits of feeling insufficient are so strong, awakening from the trance involves not only inner resolve, but an active training of the heart and mind. Through Buddhist awareness practices, we free ourselves from the suffering of trance by learning to recognize what is true in the present moment, and by embracing whatever we see with an open heart. This cultivation of mindfulness and compassion is what I call Radical Acceptance. Radical Acceptance reverses our habit of living at war with experiences that are unfamiliar, frightening or intense. It is the necessary antidote to years of neglecting ourselves, years of judging and treating ourselves harshly, years of rejecting this moment’s experience. Radical Acceptance is the willingness to experience ourselves and our life as it is. A moment of Radical Acceptance is a moment of genuine freedom. For many of us, feelings of deficiency are right around the corner. It doesnt take much--just hearing of someone elses accomplishments, being criticized, getting into an argument, making a mistake at work--to make us feel that we are not okay. Beginning to understand how our lives have become ensnared in this trance of unworthiness is our first step toward reconnecting with who we really are and what it means to live fully. Believing that something is wrong with us is a deep and tenacious suffering, says Tara Brach at the start of this illuminating book. This suffering emerges in crippling self-judgments and conflicts in our relationships, in addictions and perfectionism, in loneliness and overwork--all the forces that keep our lives constricted and unfulfilled. 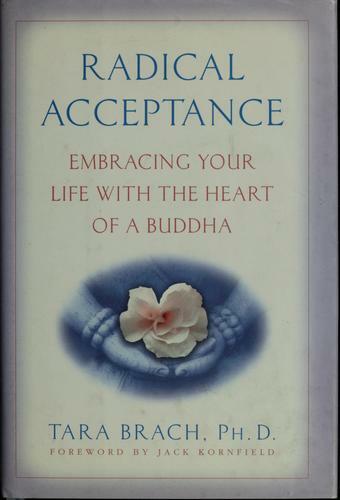 Radical Acceptance offers a path to freedom, including the day-to-day practical guidance developed over Dr. Brachs twenty years of work with therapy clients and Buddhist students. From the Hardcover edition. """Believing that something is wrong with us is a deep and tenacious suffering,"" says Tara Brach at the start of this illuminating book. This suffering emerges in crippling self-judgments and conflicts in our relationships, in addictions and perfectionism, in loneliness and overwork--all the forces that keep our lives constricted and unfulfilled. Radical Acceptance offers a path to freedom, including the day-to-day practical guidance developed over Dr. Brach’s twenty years of work with therapy clients and Buddhist students.